Buzzmeeh.com introduced to make life simpler for people hunting for a local mobile repair shop and solve their inconvenience of being stuck with an inefficient standby handset. The online portal is a disruptor in the mobile repair market, offering services beyond mobile mending with pick-up and drop off services, standby handsets and live SMS updates. 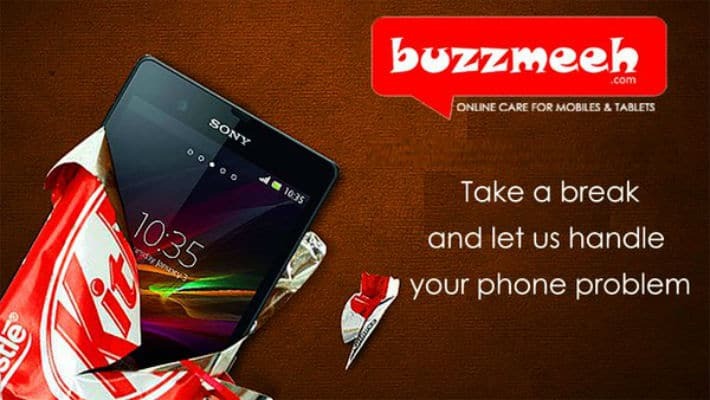 Based out of Delhi-NCR region, Buzzmeeh.com offers a simple and cost-effective process for all mobile users to get their mobiles phones repaired in a click. Taking mobile repairing beyond the industry norms, its gamut of services ensures complete customer satisfaction. Customers can avail pick up and drop off services anywhere in the Delhi NCR region, within two hours of a request being placed on the website. Buzzmeeh gets under warranty handsets repaired from the official service center and if not under warranty, its in-house experts repair the same at a minimal cost. Furthermore, the customers can continue enjoying the smartphone services even while their handsets are in the repairing center, with the standby handset offered by Buzzmeeh.com. The platform also sends out live SMS services updating the users on the progress of their phones. It provides genuine replacement for damaged parts with a 30-day warranty. Within a few months of its launch, Buzzmeeh is on an expansion spree across the length and breadth of the country. It works at easing the issues of distrust and lack of responsibility that the customers feel towards mobile service providers and offer a credible and convenient solution to mobile repair. BUZZMEEH IS A BUNCH OF 8-10 FRAUD PERSONS OPERATING FROM NOIDA and they will remove all the genuine parts from your phone and even threaten you over phone. From manager to technician they don’t know how to talk. Do not get your phone repaired from them. They destroyed my phone and even asked for money by sending gunde at my address and they keep on disturbing you once they got your address and contact details. Service centres are the best option for your respective company. Or the Karol Bagh market is far better option then these fraudsters. I had a horrendous experience with this Company called BUZZMEEH located in Sector 63 Noida. They call themselves a mobile phone repair and services organization but in fact are a “Mobile phone original parts stealing” organization. They take the mobile phones to their service center in Sector 63 Noida and replace the original parts with inferior quality unbranded parts. I picked up my iPhone 6s 64 GB Gold IMEI number 355765075274299 from authorized Apple service center Zenica Lifestyle Pvt. Ltd. located in Mall of India, Noida on 25th April, 2017 (refer to attachment). The Zenica store employees were ready to replace my iPhone at an exchange price of INR 27,000. I did not want to spend that amount of money and looked for mobile repairing companies in Noida. To my bad luck, I came across Buzzmeeh. I called their customer care number and scheduled an appointment to repair my phone at my residence. Mr. Adeep (Mob. No. – 9643666752) was sent to repair my phone on 25th April itself. He was an expert and opened up the phone within a few seconds. After repeated attempts he could not switch on the phone and informed me that the phone needs to be taken to the workshop for repair and will be returned by 26th April evening. There was no verbal or written mention of any unbranded parts in the mentioned iPhone (refer to attachment). I followed up with Buzzmeeh people after that and they kept postponing the date of return of the phone. Finally after 8 days, on 4th May, 2017 the unrepaired phone was returned to me as they were busy replacing the original lightning connector and mother board with inferior ones. The question arises “Why did it take them 8 days to return the phone if it was irreparable? I received the phone from the Buzzmeeh executive and signed the receipt and kept it safely in my drawer. Next day, on 5th May, 2017 I went to the above mentioned Zenica store with the intention of paying INR 27,000 and getting my phone replaced. To my utter shock, the apple manager informed me that the mother board and the lightning connector of the phone have been changed and thus I am not eligible for the replacement offer. I begged him to please give this to me in written which he did (refer to attachment). He also informed me that the replaced motherboard (Serial number DNQQH60CGRYF) belonged to a rose-gold iPhone and it had been severely tampered with. I was furious and reached the Buzzmeeh office immediately. Mr. Puneet Gupta (founder) himself came to solve the case when he understood that it was a serious matter. He apologized to us after a thorough understanding of the details. He committed to us that he will help us in buying a new iPhone 6s 64 GB Gold by contributing the amount in excess of INR 27,000 as that was the amount I was ready to pay to Zenica store for the replacement. The condition was either he will arrange for my original motherboard and lightning connector so that I can get the phone replaced at Zenica by paying INR 27,000 or he will compensate by buying the new iPhone. Fortunately I pulled out a sheet of paper from a diary lying in his office and got his signatures on this commitment (refer to attachment). He requested that he needed some time to find the parts and to question his employees regarding this case. He also mentioned that one of his employees Mr. Vivek who was a senior technician at Buzmeeh had recently been fired 2 days back due to other customer complaints and he might be the one responsible for this happening. He also requested for documents related to the phone which I send him by Whatsapp. On 9th May when I confronted him about the commitment that he had made in writing, he said that it was not his or Buzzmeeh’s fault and I can take legal action against him. I was going through certain reviews of Buzzmeeh on Consumer complaint forums and they suggested similar experiences. My submission to various information portals is to delist Buzzmeeh and take action against them so that Buzzmeeh cannot bluff customers in the future. I will take the matter to the local Consumer Court as well. Please refer to the attachments for other details. Let me know if any other document or information is required. They took 10 days to repair my iphone and they do not even replying me about my phone’ status. There executive took my SIM card along with my phone and they lost my SIM. In 10 days I made atleast 20 call to know the status of my phone.. they just put me on hold and they disconnected my call.